Here is another view of our area in the middle of it. The wind spread the snow in some crazy patterns. The front of our building got completely covered, but the school across the street and our parking spaces had barely any. The alley our parking spaces feed into were slammed as well. Note how little snow is in front of the school on the right. This isn’t because it was well cared for (well, that helped). It was because the way the wind whipped around. 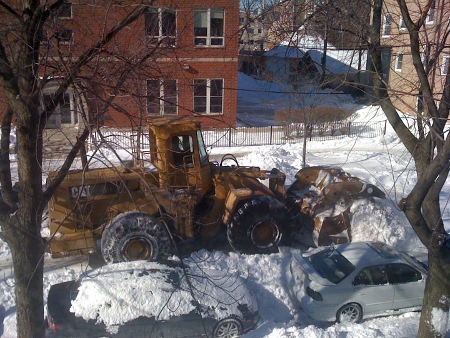 Now, in the next few hours, the city managed to get a “plow” to our street. It’s a monster. They are all over the city still, slowly digging the massive mounds of snow up that have been shoveled and plowed into big piles. 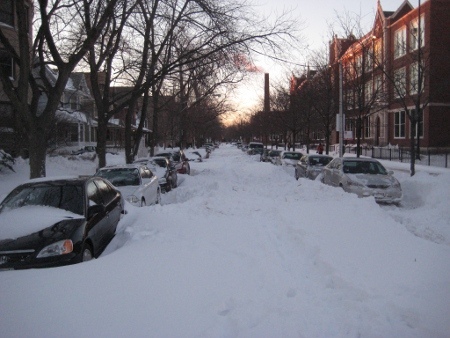 I feel like the storm brought out a lot of good in our neighborhood with people helping to dig others out. It also brought out the annoying habit of people marking their street parking places (I can understand the intent but it rubs me the wrong way). Anyway, let’s wrap up our coverage of this event with a couple of photo dumps. Here’s all the photos Carolyn and I in our photo dump and here is Anne’s flickr dump. Apparently, by next week, it’ll be above freezing and all this lovely snow will be gone. By popular demand, I would like present a photo dump of our trip to Denver and Arizona. ‘Twas a lovely time and a good start to what looking like a busy couple of months of travel and visitors (hurray!). Well, in an attempt to not lose the blogging momentum, I’ve been back from Greece for less than 24 hours and here I am writing! This will just be a photo dump with a few select photos. In a nutshell, Greece was amazing. Relaxing, beautiful and fun. That sums it up nicely. I’ll have to post multiple things to get it all in since we spent time on 4 islands and Athens. Busy busy. Anyhoo, you can now see all our unedited Greek photos. 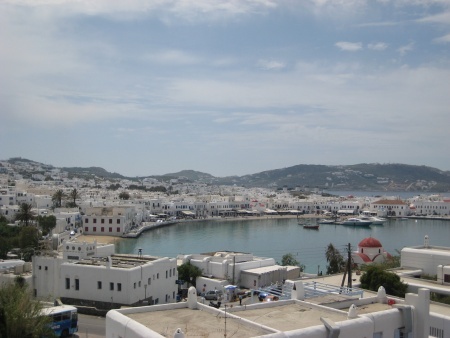 The lovely town of Mykonos. In the summer, this place is a mob-scene, but show up a couple weeks early and it’s quite wonderful. 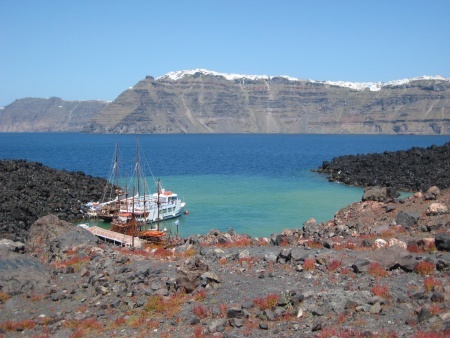 The Caldera, volcanic center and town of Santorini. Yes, the white on the tops of those cliffs is a town and the houses all mostly white and blue. Love this photo. Much more on Santorini to come. 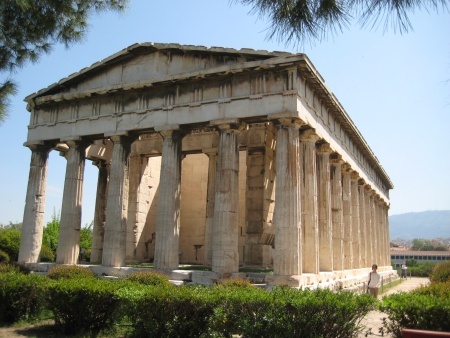 The Temple of Hephaestus in Athens. Not as big as it’s neighbour, the Parthanon that sits atop the acropolis, but it’s more intact. It was a joy to come upon this in the Ancient Greek Market (aka. the Agora). Entries (RSS) and Comments (RSS).25 queries. 0.331 seconds.